1 pack liquorice wheels, unravelled (don’t like liquorice? Use strawberry laces instead). Cut the liquorice to your desired lengths. Stick eight into the cream filling of an Oreo so there are four on opposite sides. Dot two small blobs of frosting on top for eyes and stick a couple of round sprinkles on for detail. 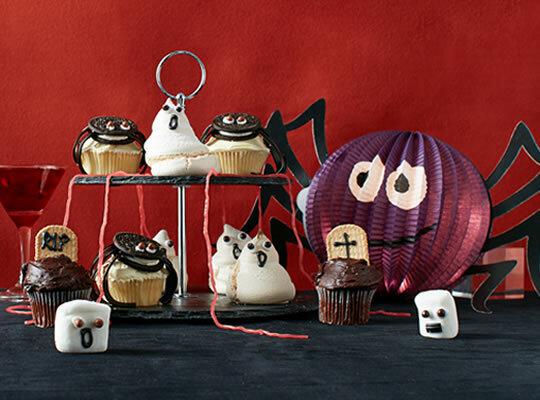 Generously spread buttercream on top of the cupcakes and stick the spiders on top. Cut the Rich Tea finger biscuits in half. Pipe ‘RIP’ on the flat side of the biscuits with your black icing (make sure the rounded sides of the biscuits are facing up). Generously spread chocolate frosting on top of the muffins. Stick your ‘tombstones’ into the frosted cupcakes. Preheat the oven to 120°C/100°C fan-assisted/Gas Mark 1/2, and line a baking tray with baking parchment. Beat the egg white with an electric whisk until they form stiff white peaks. Whisk in the sugar and cornflour until glossy. Scoop the mixture into your prepared piping bag. Pipe fat, ghost-like swirls onto the lined baking tray, leaving at least 5cm of space between them as they expand in the oven. Bake for about 1 hour, until crisp. Take your ghosts out of the oven, allow to cool completely, pipe on eyes and mouths and stick the sprinkles on the eyes for extra detail. How easy are they? BONUS: For mini ghosts, pipe little faces on white marshmallows with black icing and stick on sprinkles for eyes just like their big meringue ‘brothers’. For more ideas, our Halloween recipes page for more ghoulishly good dishes – and don’t forget to take advantage of our Dead Good Deals. This entry was posted in Talking Ocado and tagged Halloween, Halloween ideas, Happy Halloween, party food, Recipes, snacks by Ocado. Bookmark the permalink.